By BoltBait, April 20, 2015 in Plugins - Publishing ONLY! Install the .dll file the normal way, then restart paint.net. You can do everything this plugin does with the built-in Layers > Rotate / Zoom effect. 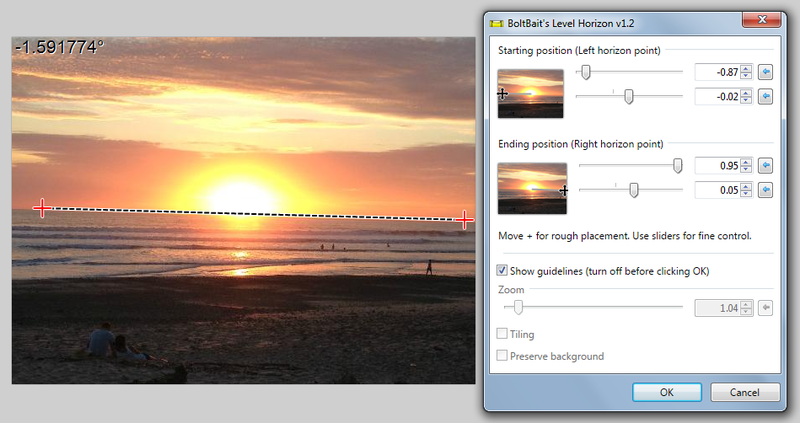 However, I think you'll find this MUCH easier for leveling a horizon. That roll control is cool, but not very easy to get just the right angle for adjusting a horizon. v1.3 - Added Plumb Bob functionality. Corrections of +/- 45* or less count as horizontal, greater than that count as vertical. v1.2 - "+" indicators now red. Added IndirectUI rules. Full project now. v1.0 - Initial release. CodeLab script. It looks great, but the horizon isn't level! Let's fix that. 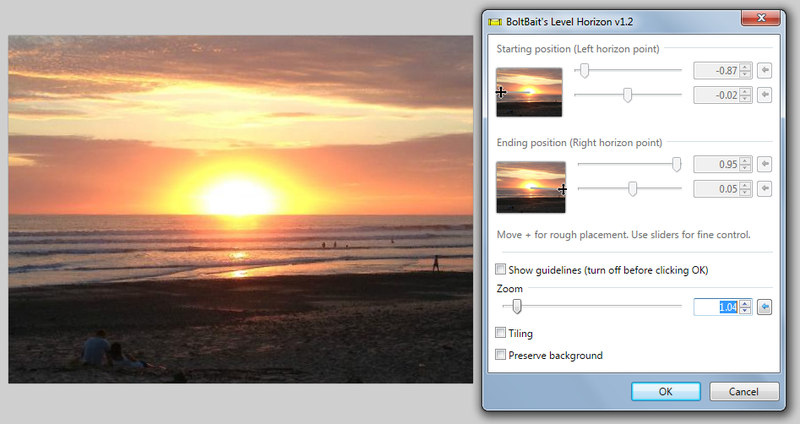 Load your desired image and use the Effects > Photo > Level Horizon menu. Move the effect UI out of the way so that you can see your image to work on it. Using the black "+" in the effect UI under "Starting position" place it on the left side of your image on the horizon. Then, using the black "+" under "Ending position" place it on the right side of your image on the horizon. 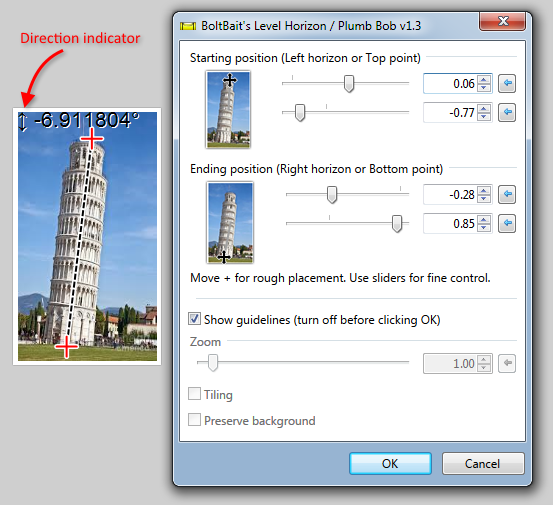 Note: Use the + for rough placement, then use the sliders or data entry options for fine control. Once you are happy with the location of the horizon indicator line, click the "Show guidelines" check box to turn off the guidelines and show the rotation effect. 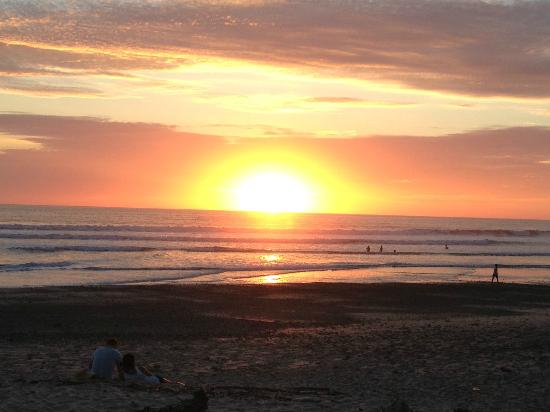 You should see the image rotated so that the horizon is now flat. If you look in the corners of the image you should see some checkerboard pattern. This indicates where there is no image. We'll fix that next. 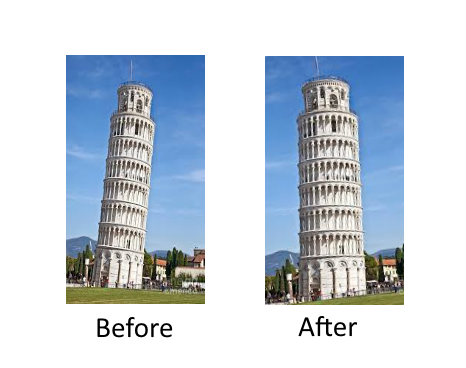 Adjust the "Zoom" slider until the corners of your image are filled. I usually just click the little up arrow a couple of times and that does the trick! Click OK to finalize your image. The effect dll you can download above is a little more complex in the UI department, but this will show you the algorithm. BoltBait! Thanks for the plugin, tutorial info and for your effort. Nice Work BB, great for those Frisco street scenes. Really cool Plugin @BoltBait . Thank you . She needs a plumb bob, not a spirit level. Great plug-in and tutorial. Thank You for the Source Code - this is a cool tutorial too! I have added the Plumb Bob capability to the plugin while waiting in line at the DMV. Go get your fresh copy! NOTE: I'm done updating this. User midora is working on a better version of this plugin. Go download his when it is ready. Wow! How quick was that . Impressive . In line at the DMV - Ugh - that can take hours - bet you wish it'd been at McDonalds instead . Sometimes requested changes are easy, sometimes they are hard. This time it was the former. Plugins can not register a hot key.